With the winter months quickly approaching, contractors and business owners have to start thinking about preparing their equipment for harsh winter weather conditions. Whether working in the freezing temperatures or storing equipment for the season, companies need to ensure proper winter maintenance in these seven areas to avoid costly problems come spring. If the machine uses diesel exhaust fluid, or DEF, it’s important for operators to know that it can freeze and thaw without hurting its ability to function properly. DEF has a shelf life of one year. If owners aren’t going to use their equipment during the winter, it’s a good idea to store indoors in temperature-controlled environments that are out of direct sunlight. Also, make sure to store DEF in an HTPE plastic or stainless steel container, as it is mildly corrosive. DEF can be filled up prior to storage, however, make sure to leave room for expansion. DEF can expand in the winter up to seven percent and potentially crack the reservoir. Pumps used in DEF dispensing systems require protection at temperatures lower than zero degrees Celsius. If the machine will remain in use throughout the winter months, the best option is to use an insulated heat blanket for DEF Totes. The blankets protect the DEF fluid and pump assembly from freezing. But if the machine will not be used during the winter, then pumps should be drained. If the machine isn’t going to be used for the winter and will be stored outdoors, it’s best to remove the batteries and store them indoors to prevent freezing. Any time a battery will be sitting for an extended period, it is best to connect it to a battery maintainer to keep it at a full state of charge. This will keep it ready when the time comes to use the machine. Contrary to belief, cold temperatures don’t significantly impact the service life of a battery. However, it does induce stress, amplifying the effects of time, heat, vibration and performance of the charging system. If the machine will be operated throughout the season, it’s important to make sure batteries are properly charged. An under-charged battery can perform well at 27 degrees Celsius, but its true condition becomes evident at -18 degrees C when starting current demands can increase by 200 percent and a battery, even in great condition, is reduced to 40 percent of its summer cranking current. Tires require daily care and maintenance during winter. It’s important for equipment operators to take steps to reduce tire wear while operating equipment. Always keep tires properly inflated, and remove counterweights when not in use, as they put additional stress on the tires. Look for even wear, remove debris and inspect tires for any cracking and chunking. If the centre of the tire is worn smooth, or there’s any chunking, then it’s time to replace them. 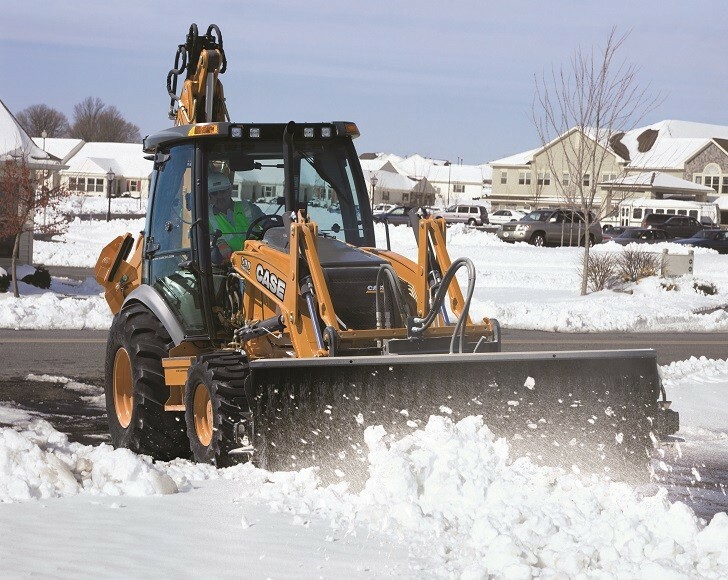 In order to properly maintain equipment operating in cold temperatures and snowy conditions, operators should alter their operation habits to ensure equipment longevity. Behaviors like minimizing high operating speeds and onroad travel, and alternating turning directions can be the difference between downtime and productivity. Another important piece of maintenance is a pre-operation inspection and the proper warm-up of the equipment. Warming up the machine reduces shock to components caused by cold fluids or hydraulic systems. The potential for blown hoses or Orings increases with colder weather. Providing sufficient warm-up time will provide an operator a more productive machine as well as increase safe operation and a more comfortable operating environment. When it comes to operator behavior, excessive idling should be monitored closely, as it consumes needless fuel, warranty hours and contaminates diesel particulate filters. Condensation can build-up in the crankcase, which promotes the build-up of acids and sludge, leading to costly downtime and potential repairs. Protecting your equipment during the winter is a smart investment.